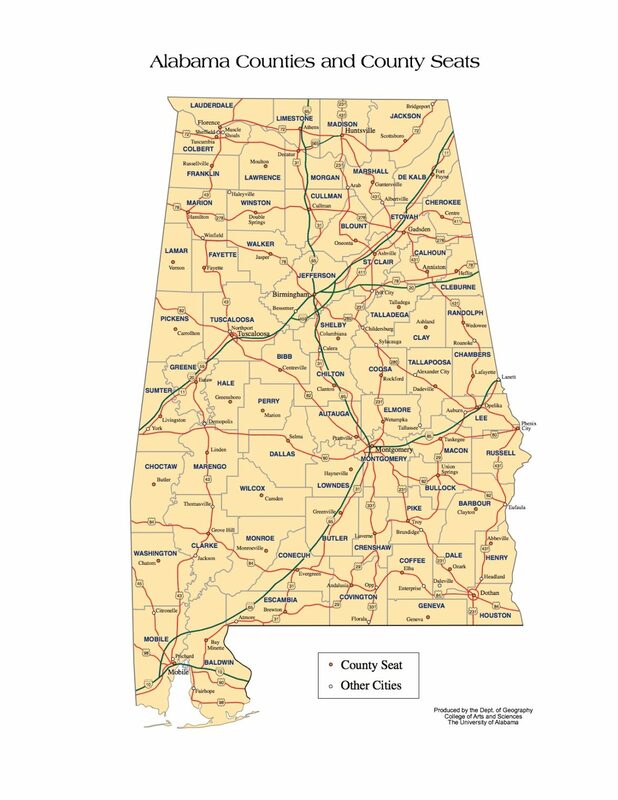 Alabama has sixty-seven counties. The oldest is Washington County (created June 4, 1800) and the youngest is Houston County (created February 9, 1903). According to 2006 U. S. Census estimates, the average population of Alabama’s sixty-seven counties is 68,642, with Jefferson County has the most people (656,700), and Greene County (9,374) the least. The average land area is 757 sq mi (1,960.6 km2). The largest county is Baldwin (1,596 sq mi (4,133.6 km2)) and the smallest is Etowah (535 sq mi (1,385.6 km2)). Alabama was admitted as the 22nd state in 1819. The Alabama legislature formed additional counties from former native lands as the Indian Removal Act took effect and settlers populated different areas of Alabama. In 1820, Alabama had 29 counties. Native Americans still occupied large areas of land in northeast and far western Alabama. By 1840, 49 counties had been created; 52 by 1850; 65 by 1870; and the present 67 counties by 1903. Houston County was the last county created on February 9, 1903. The average area is 805 sq mi. The smallest is Etowah. runs south into the Tallapoosa river, in Tallapoosa county, Alabama. Evergreen, Alabama is a quiet southern town about halfway between Mobile and Montgomery just off Interstate 65. Lee County Alabama is home to Chewacla State Park, the Jule Collins Smith Museum of Fine Art, Bean’s Mill, the Salem-Shotwell Covered Bridge and the Grand National Golf course which is part of the Robert Trent Jones Golf Trail.